Homemaker Highlights: Shabby Apple Review. How many of you guys are fans of vintage style clothing? If you are, you will LOVE the vintage clothing from Shabby Apple! 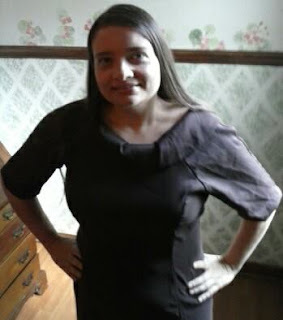 Picture of me in Shabby Apple's "Cut the cake" dress. Below is a view of dress from site (Photo courtesy of Shabby Apple), please click to go directly to site. First, I would like to say I absolutely adore the dress I picked out and received from them. It's very classic, elegant, stylish, comfortable, and even modest! Originally, when I picked the dress off of Shabby Apple I had a vision of Jackie Bouvier Kennedy Onassis wearing it with her beautiful strand of signature pearls. The neckline is really what took it back to a more Camelot era. Second, the customer service is very courteous and prompt. My dress was sent in just a matter of a few days after I corresponded over email. I received it earlier than anticipated. To me great customer service can make or break a purchase for me. The dress got a smidge wrinkled during shipping, which can be expected. I was able to smooth those out with by tossing it in the dryer for just a few minutes on a gentle tumble. My first outing in it was to church, this past Sunday. I got several kind comments on how beautiful the dress was. I sat in the pew for a fair amount of time and was very comfortable in my dress at the end of service. Overall, I would absolutely recommend this dress and company to anyone that is looking to purchase vintage clothing. It's comfortable, lined very well, and just gorgeous.